The Bayside Grange hosts it's quarterly pancake breakfast at 2297 Jacoby Creek Road. Check out the Electric Vehicle show outisde, while breakfast and entertainment is served inside. Learn more about the Bayside Grange from their website. October 4, 11 a.m. - 4 p.m. The Bayside Grange invites the community to the quarterly Breakfast in Bayside, Sunday, July 19, from 8 am to noon at the Bayside Grange, 2297 Jacoby Creek Rd, at the intersection of Jacoby Creek and Old Arcata Roads in Bayside. For more information visit the Bayside Grange website. HEVA member Roger will be presenting a workshop highlighting the history of electric cars and the practical and economic aspects of converting a used vehicle to electric power. The workshop will be held at the Redwood Coast Energy Resource Center at 517 Fifth Street in Eureka. The next event that HEVA will participate in is the Humboldt State University Sustainable Living, Arts and Music festival. It is held on Saturday April 25 from 3pm to 8pm in the Gist Hall parking lot. More information on the SLAMfest website. The Bayside Grange hosts it's quarterly pancake breakfast at 2297 Jacoby Creek Road. Join HEVA for a hearty breakfast while we show off our vehicles at this community event. Learn more about the Bayside Grange from their website. Humboldt Plan It Green is hosting the 3rd annual Building Green Communities Conference & Expo at the Arcata Community Center. The theme this year is "Wheel of Change" and will feature workshops, discussions and exhibitors relating to sustainable communities and transportation. HEVA will be exhibiting vehicles, including a parade, and providing information about electric transportation. For more information visit the Plan It Green website here. 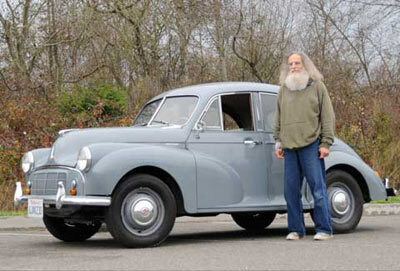 HEVA member Roger and his electric Volkswagen were highlighted in a recent Times-Standard article.Read more here. 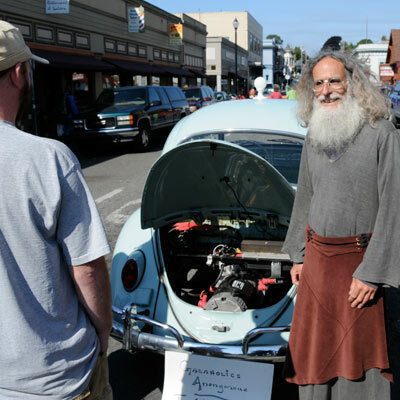 The annual North Country Fair in Arcata will be held on the Plaza this September 20th and 21st. Come enjoy this event featuring arts, crafts and all kinds of other fun things to do and see. Also, be sure to look out for Electric Cars at this event - HEVA members are always ready and willing to show off their vehicles and talk about alternative transportation issues. See you there! Kevin Johnson and his electric car were featured in a Eureka Reporter article highlighting the advantages of solar power. Read more here. HEVA members were excited to participate in the ribbon cutting ceremony to inaugerate the new Electric Vehicle charging station in Arcata on Saturday June 7. Years of hard work and diligence have finally paid off for the ever growing electric vehicle community in Humboldt County. To read more, visit the Times-Standard or the Eureka Reporter. Saturday June 7 at 10am there will be a ribbon cutting ceremony to inaugurate the new charging station in the F street public parking lot near City Hall. After the ceremony, all users of alternative transportation are welcome to take part in a loop around the plaza to help raise awareness of our cause. Electric Vehicle owners are also invited to arrive early (between 9am and 9:30am) to line up their vehicles near the charging station. Let's let everyone know that Electric Vehicles are a viable alternative to fossil fuels! The City of Arcata's new Electric Vehicle charging station will be officially opened this Saturday June 7 at noon. Come join HEVA as we celebrate the culmination of over four years of effort. The charging station is in the public parking lot behind the fire station at F and 8th streets. After years of effort on the part of HEVA and the city of Arcata, the electric vehicle charging station is almost done. Located behind the fire station, in the public parking lot near F and 8th streets, the charging station includes both 220 volt and 110 volt charging with a variety of common electrical sockets. With only a few minor finishing touches to attend to, and "official" grand opening of the station should be only weeks away. For $8 per meal ($5 for children and seniors), you can join your friends and meet new ones at this quarterly event. At the next breakfast, expect to see HEVA members showing off their electric vehicles (mostly four wheels, but there might be some others, too!). The breakfast strives to be a Zero Waste event by encouraging recycling and composting, and bring your own favorite coffee mug if you can. Bayside Grange, April 20, 8:00 AM to Noon at the corner of Old Arcata Road and Jacoby Creek Road, across from the Post Office. The HSU Sustainable Living Arts and Music Festival includes entertainment, food, tech displays, vendors and more. HEVA members will be there to share their EV experience and, of course, show off their cars. Bring your own fork and cup to help reduce trash. The SLAMfest is a zero waste event. The CR team to compete at the Shell Eco-marathon is putting the finishing touches on their diesel powered "racer". Incorporating technology including ultra light weight materials, an aerodynamic fuselage and a small fuel-efficient diesel engine, the team is excited to be participating in the event and looks forward to learning from their experiences and their competitors. Plan It Green announces the 2nd Annual “Building Green Communities Conference” at the Arcata Community Center on April 4-5, 2008. Saturday April 5th will be open and free to the public and will include a tradeshow featuring green building related products and services as well as workshops, displays, demonstrations and a benefit dinner. HEVA members will be there to display their vehicles and answer questions about sustainable transportation. Visit www.HumboldtPlanItGreen.com for more info. Students in the Industrial Technology program at College of the Redwoods are constructing a thousand mile-per-gallon vehicle. Powered by a five horsepower Hatz diesel engine, the aerodynamic, light weight vehicle and its builders will travel to Southern California in April to compete against other super-efficient vehicles. Last year the vehicle from Cal Poly San Luis Obispo achieved 1,903 MPG. Read more about the CR team in the Times-Standard. Several newly converted and refurbished vehicles are in various stages of completion. Come to our next HEVA meeting to find out what our members are working on right now, what vehicles are currently available, and what our next projects will be. The North Country Fair is taking place in the Arcata Plaza on September 22 and 23. This exciting event to celebrate the equinox will include vendors, food, infomation booths, entertainment - and of course the Humboldt Electric Vehicle Association. HEVA members will be present to show off our cars and tell you how to get involved in electric cars and sustainable transportation. Be there! HEVA members will be showing off their vehicles and answering questions at the Northcoast Environmental Center (NEC) on September 14th around 5pm. Visit the NEC website at www.yournec.org to learn more. The third annual Organic Planet Festival will be held on Sunday, August 26 from 11am to 7pm at Halvorsen Park in Eureka. HEVA members will be displaying their vehicles and answering questions about sustainable transportation and solar energy. Please join us at this fun and educational event. For more information about the Organic Planet Festival please visit their website. The Electric Vehicle charging station in Arcata is nearing completion. So far city of Arcata has installed all the necessary equipment to provide Electric Vehicle charging in the public parking area on the corner of 8th and F streets. Currently HEVA is working with city officials to make the final preparations to activate the station. On Saturday April 21, despite less than ideal weather conditions, the HSU sustainable Living, Arts and Music Festival took place with many students and community members enjoying the displays and events being held in the Gist hall parking lot. HEVA members were displaying their vehicles and answering questions about non-fossil-fueled transportation. Read more about the SLAMfest in the Eureka Times-Standard. HEVA members will be displaying their vehicles and answering questions at this zero-waste event powered entirely by solar energy and bio-diesel. This event will also feature live music and art demonstrations. $5/discount with can of food. Free to HSU students. Free Kids Area. For more information click here. Check out the Feb/Mar 2007 edition of Home Power magazine. HEVA member Kevin Johnson wrote the article "Solar Electricity at home" which gives a detailed description of how Kevin and his family use solar power for nearly all their transportation needs. Kevin has been driving electric since 2003 and doesn't miss gasoline. Click here to download a PDF version of Kevin's Article from the Home Power website. 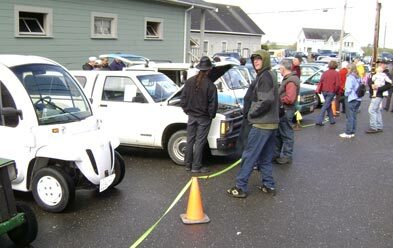 The Arcata Police Department is issuing Electric Vehicle parking permits to anyone with an EV in the area. The permits allow parking in any space that has a city operated parking meter. Most of these kinds of meters are on the streets at HSU. To obtain one of these permits call the Arcata Police at (707)822-2428. All you need is your current vehicle registration indicating that your car is electric. The permit is free, and valid for one year, after which it can be renewed.